One of the largest exhibits of its kind, The Shark Reef at Mandalay Bay houses more than 2,000 species of aquatic life including sharks, exotic fish and more. Click Here to purchase tickets with Best Price Guarantee! Housing more than 2,000 animals including sharks, exotic fresh and saltwater fish, a massive sea turtle and much more. Shark Reef offers the aquatic experience of a lifetime. The ocean is probably the last thing people think of when they visit the dry desert of Las Vegas, but the Shark Reef at Mandalay Bay changes that. Shark Reef is reminiscent of an ancient temple slowly sinking into the ocean. 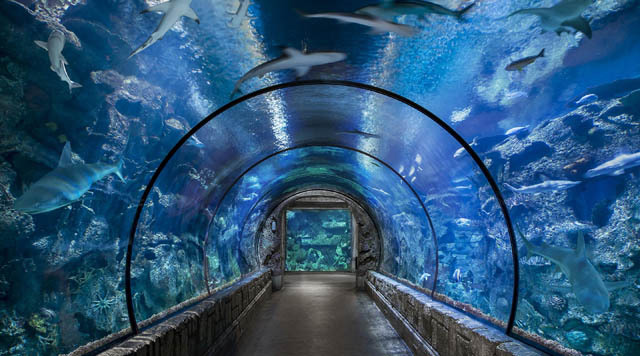 The tunnel, which houses five species of sharks and the aquarium’s largest animals, is designed to look like a sunken shipwreck. Here, visitors can witness a scuba diver’s view of these mesmerizing creatures, including nurse sharks and tiger-striped sharks measuring up to nine feet long, and two tiger sharks that measure more than six feet in length. When divers swim in to clean these tanks, they wear a stainless steel mesh, similar to what knights wore long ago. The metal helps keep the animals away so the humans don’t look like food. Since many of us aren’t planning to pet a piranha anytime soon, visitors can enjoy getting a “hands-on” experience with various stingrays, eels and crabs at the touch pool. Also at the Shark Reef is an eight-foot-long Komodo dragon, the largest species in the lizard family. This particular Komodo lives within an environment similar to its habitat, complete with sand, boulders and a pool. For those who want an in-depth, personal enrichment about the animals, audio wands are available in Spanish, English and Japanese. In addition, Shark Reef’s naturalists are available to answer any questions visitors may have. Located at the end of the exhibit, Shark Reef’s gift shop features an assortment of figurines, picture frames, trinkets and souvenir photos for those who took one right before the tour.